This is a blend of benzalkonium chloride (quaternary ammonium compounds or QAC´s) specially selected for safety of use. This family of chemicals are powerful disinfectants with an additional detergent and deodorising action. At the recommended concentrations ARK-KLENS is non-corrosive, it is bactericidal against a wide range of gram negative and gram positive bacteria, some viruses and some fungi are also susceptible. 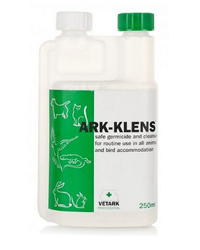 This makes ARK-KLENS suitable for disinfection of the birds or animals "environment" such as cages, kennels, and food and water bowls etc. It can also be used safely as a disinfectant for birds eggs and incubators.